A big catch for fishing fans. The perfect gift for friends and family members who love to fish. Send this fishing gift basket filled with tasty snacks. For your Fisherman friend or family member. 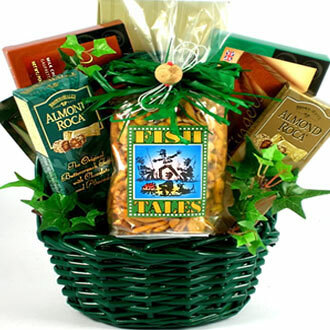 Surprise them with this fishing basket filled to the top with delicious snacks and treats. Your fishing gift includes a hand-crafted, hunter green basket with 'Fish Tales' gourmet snack mix, assorted Biscotti, Mint Chocolate Wafer Cookies, Milk Chocolate Wafer Cookies, White Chocolate Cranberry Mountain Mix, White Chocolate Hot Cocoa and French Vanilla Gourmet Mocha!